FWH will add to bitterness just like 60 min hop additions. How would they not? Both boiling for 60 minutes. I have read that FWH taste less bitter in the end vs 60 minute hop additions. Well it does add to the bitterness of course but I believe you don't use a straight bittering hops it's suggested to use a dual use or finishing hops then drop out any hop additions before 30 minutes. So you get bitterness but it adds to flavor. The article above suggests it is a hops saving technique not quite sure about that. Of course this is just conjecture from the literature I've been reading. just like 60 min hop additions. As I said above...I disagree...sorry you find my disagreement objectionable but I don't believe they bitter "just like 60 min additions." 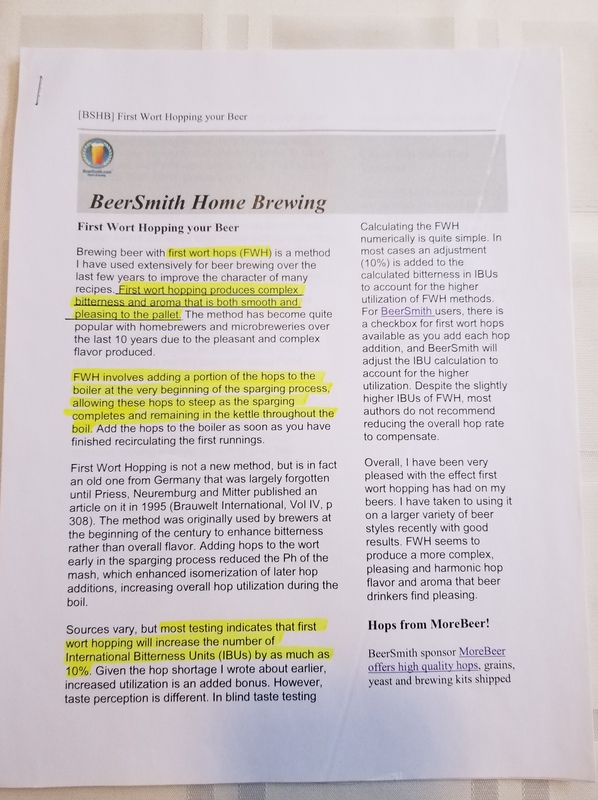 When selecting FWH in BeerSmith, I believe it uses the boil length you've entered in the recipe to calculate contributed IBU's. If I recall, changing the steep time (i.e. 15 min, 75 min, etc) within the actual FWH step doesn't change the IBU contribution. That being said: I just brewed my SMASH hoppy lager. For 10 gallons and a 75 minute boil, I use 3 oz. of FWH to get about 31 IBUs (5.4% US Saaz), and 2 oz. at 15 minutes left, to get another 12 ibu. This beer usually has a nice smooth bitterness, with plenty of flavor and aroma. FWH and 60 min additions both add significant IBUs to your end result. The Beersmith article says FWH may even add 10% more IBUs to the batch vs 60 min additions but end up with a more smooth beer (better beer). This is why I said don't do both. You don't want to double your IBUs by saying you can do both and you can not compare FWH to 5 minute aroma additions or flame out additions. If one wishes to split the % between FWH and 60 minutes, that is cool. I stated that I personally prefer FWH vs 60 minutes for the reasons I mentioned prior. No rise in BP here. Like @brew_cat I generally have used flavor/aroma hops because I'd always been told that you could consider the contribution of FWH like a 20 minute addition. My bitterness comes from higher AA hops at 60 minutes. @denny always used to say, don't expect FWH to replace your bittering charge so I've gone by his advice on that for the most part. Is that the Kraze for Haze issue? No, the find your hoppiness issue. I wont make make the recipe they give but alot of science on hops that I didn't know. @brewcat I found this article very interesting as well through the first read. My brain was congested after all of that but I will reread a few times and try to get a grasp on what they're saying. I've been brewing all NEIPA's lately and they're pretty good but not quite what I like in some commercial varieties. It is recommended that you change your hop utilization for FWH to that of a 20 min addition to approximate the perceived bitterness. Even though the hops are in contact with the wort for an extended period of time (longer in fact, then a 60 min addition), the perceived contribution to bitterness is significantly less than a bittering addition. Yes, it is true that if you send your beer to the lab, it will measure a higher IBU level from FWH (like Tom said, 10% higher than a 60 min), the bitterness that you taste will be lower. So when you FWH if you care about how bitter your beer TASTES, change the utilization to match a 20 min addition. That is what I've heard also. I do have a ton of Citra hops to use up so I may toss some in the mash just to see what happens.